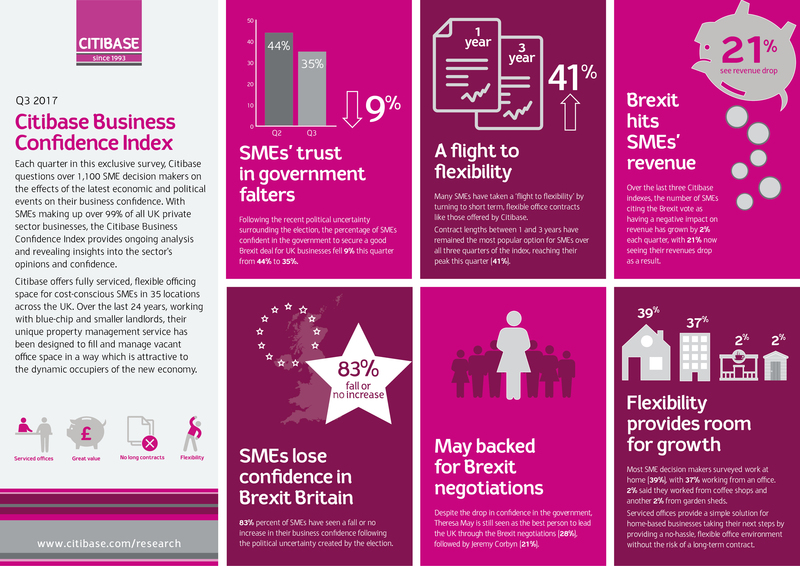 SMEs no longer trust the government to secure a good deal for UK businesses in their Brexit negotiations, with only 35% stating their confidence in the latest Citibase Confidence Index, down 9% from the previous quarterly index. As a result, SMEs are taking a “flight to flexibility” when running their businesses, according to Citibase, one of the UK’s largest operators of fully serviced offices and a champion of small businesses. The appetite for flexible office space is reflected in Citibase’s annual results, delivering its best year of business in its 24-year history, with a 23% rise in year on year earnings (EBITDA). Cost-conscious SMEs’ increasing desire for flexibility is revealed in their preferred length of office contracts, with leases between one and three years remaining the most popular option over all three quarters of the index, reaching their peak this quarter (41%), with the North East showing the highest at 54%. A regional divide emerged on views over who is best placed to lead Brexit negotiations. North East businesses are the biggest supporters of Theresa May, with 37% saying she was the best leader for the job. However, across the Pennines, SMEs in the North West backed Jeremy Corbyn as their first choice (27%), marginally ahead of the PM (25%). In Scotland, there was a three way tie between David Davis, Theresa May and Nicola Sturgeon, all favoured to lead Brexit talks by 16% of respondents. In London, support for Theresa May was 5% lower than the national average (23% against 28%), with Jeremy Corbyn at 20%. North East businesses placed the highest importance of any region on controlling immigration at 37%, whereas London businesses identified access to the single market as the most significant issue (36%). SMEs are a vital part of the UK economy, with 5.5 million in total nationwide*. The Citibase Business Confidence Index reflects the views of small businesses across a wide variety of sectors, including finance, marketing, legal and IT, gauging real opinions on the impact of political events on important factors such as revenue, morale, and expectations for the future. Most SME decision makers taking part in the research work from home (39%), with 37% working from an office. 2% of respondents said they worked from coffee shops and the same proportion are based in garden sheds.